We at JG Summit Petrochemicals Group believe that undertaking effective community-based programs will contribute in strengthening partnership with our host communities. With the shared goal of helping improve peoples’ lives, we are forging cooperation of local governments and the surrounding communities. From consultation to planning, all the way to project implementation, we ensure their participation and full support to our programs. Our Corporate Social Responsibility (CSR) programs focus on three areas – Education, Environment and Community Development, all of which we hope significantly help improve the lives of the communities around us, and at the same time foster volunteerism among our employees. Every year since 1998, we bring the Abot Kamay initiative to Barangays Simlong and Pinamucan Ibaba which are located in two barangays around our complex. Under our flagship Abot Kamay program has various components. With Balik Eskwela, we distribute school supplies to grade school students of Pinamucan Ibaba Elementary School and Simlong Elementary School. The Brigada Eskwela provides school chairs. 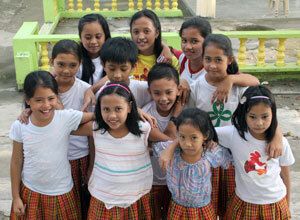 Our scholarship program has already granted nine (9) deserving students of Simlong Elementary School since 2007. We started with covering tuition fees, books, uniform and monthly stipend to the graduating grade 6 valedictorian graduate to complete their high school terms. When our first high school scholar graduated, this progressed to a college scholarship with a yearly tuition fee subsidy of Php30,000. We are all looking forward to our very first Mechanical Engineering graduate at the University of Batangas as she is now in her final year. In cooperation with the Department of Education, there is also a feeding program to enhance family coping, providing good food and nutrition, socializing and making friends. Lastly, a Christmas Outreach is held annually to bring joy and smiles to the children of Pinamucan Ibaba and Simlong Elementary Schools and nurture the spirit of gift-giving among them. Abot Kamay has been recognized with a Certificate of Appreciation given by Simlong Elementary School and a Certificate of Recognition from Pinamucan Ibaba Elementary School, which to us were seals of approval for our efforts in promoting the welfare of the children in our communities. We are engaged, in partnership with a religious group and a nongovernmental organization, in ongoing programs for the environment in surrounding areas around our Complex. We are proud of our Mini-forest and Artificial Reef Sanctuary Projects. Our two-hectare mini-forest houses a tree nursery with 50,000 saplings which will be doubled in the coming years. We have planted close to 500 trees with residents of Barangay Pinamucan Ibaba. We have deployed man-made reefs to create an artificial reef sanctuary to nurture a self-sustaining underwater ecosystem in waters around our complex. Our participation to the annual International Coastal Clean-up Days has become a tradition wherein our employees take part in cleaning portions of the Barangay Simlong coastline. As testament to how highly we value the health of stakeholders living around our complex, we provide access to health services through medical missions that are held biannually. In times of calamities, we join relief efforts to assist the communities around us to quickly recover by distributing relief goods such as food including snacks and noodles which are proven effective in preventing hunger and providing much needed energy to distressed individuals and families. Helping improve the lives of people living in communities around us is a long-term commitment. We continue to hold dialogues with the Pinamucan Ibaba and Simlong local governments as we put high importance to their inputs and to the voices of the people they represent, as we expand our social development and CSR projects for our host barangays.